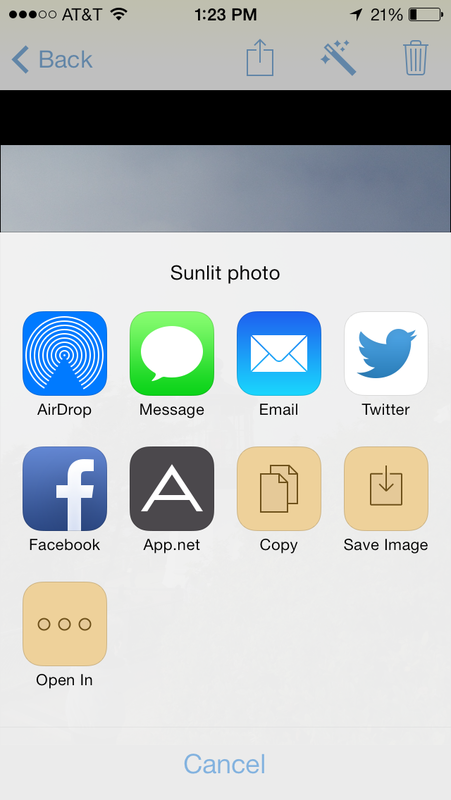 As Manton explained on his blog, we have been working on Sunlit for a long time. During that time, I can tell you that Sunlit changed and evolved from what we originally had envisioned. However, if you listen to Core Intuition, you know that we’ve been beta’ing the app for quite a while. So, when Jared Sinclair and Justin Williams announced the Overshare Kit open source replacement for iOS UIActivityViewControllers, we had a hard decision to make. We had to decide if it was worth adding new functionality at such a late point in our development or if we could live without it. Now, I don’t want to get into a UI/UX design war with anyone. I know that there are various, differing opinions on the look and feel of iOS 7 and I am but a humble developer. However, if you have ever implemented a custom UIActivity in iOS it is undeniable that the monochrome icons that you are forced to use look inexcusably ugly. In fact, they are so disappointingly ugly that Manton and I felt that we had no choice but to use Overshare Kit. I am proud of many things that we’ve built into Sunlit and our support for Overshare Kit is one of them. I love the iOS development community and Jared is a great guy so being able to support a project that he owns and cares about is a good feeling. We also had the opportunity to contribute directly to the project and a number of changes that we made for Sunlit made it back into the master branch. To me, this is the heart and soul of iOS development. It’s doing things with other people that share your value of quality. If you are a developer, and you haven’t checked out Overshare Kit, you really should. It allows you to create beautiful sharing activity views. It comes with some of the most common ones out of the box (Facebook, Twitter, etc) and is fairly easy to extend. Jared is also very responsive with suggestions/fixes for things, and while it’s only been around for a few months, I can’t recommend it highly enough. Oh, and if you’re having trouble integrating it, feel free to hit me up. I’d love to see more apps using it.